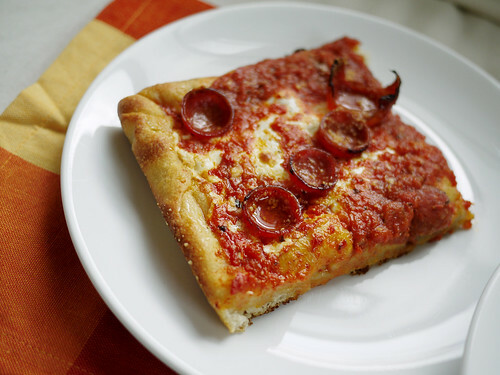 The guys in the office have been stark mad raving about the deep dish pizza at Prince St Pizza, the new pizza joint that took over the old Ray's Pizza. We haven't had a chance to go over yet and we didn't have to today because they ordered in one too many pies. Awesome for us right? Halfway through the oversized second slice I thought I had better stop because I was so full, but I couldn't because it was sooooo good. That makes three lunches in a day that have been rather stellar. Where to tomorrow then? Where the heck is the cheese on that pizza? Throw it away! The slices here are constructed like L&B Spumoni Garden in Brooklyn, i.e., cheese directly on the dough and sauce on top.